Mahasivratri is the auspicious time for each of us to do the ultimate pilgrimage- the pilgrimage within to wake up and rebirth as the Yogi. This coming Mahasivratri falls on March 4th 2019. Mahasivratri is the most significant spiritual festival observed by millions across India. Dedicated to Lord Siva, the Lord of Destruction of the limited, Mahasivratri holds the blessings of the unlimited, the Spirit. Lord Siva is called the Yogi as He is the perpetually infinite in unions with the finite. Hence Mahasivratri is called the Great Night of the Yogi, Lord Siva. – To awaken to the joyfulness of “Being” a person of higher consciousness and thereby imbibing all the qualities of higher consciousness: abundance, harmony, love and wisdom. – To be a Master, a Yogi awake. This day of Mahasivratri is based on the lunar calendar; during this period our consciousness easily condenses into divine awareness. From the yogic perspective, the Moon directly influences the mind and our consciousness. Each month, the new Moon and full Moon energies offer their own unique power as the Earth rotates around the Sun in its oval-shaped orbit through the year. Mahasivratri is a sacred vortex of time caused by the once a year alignment of Earth in correlation with the moon and sun; Earth and the planets and stars. Yoga as practice is the daily discipline of push and the sacred grace of the pull. For a yogi, it is time to transcend the human and be Spirit. 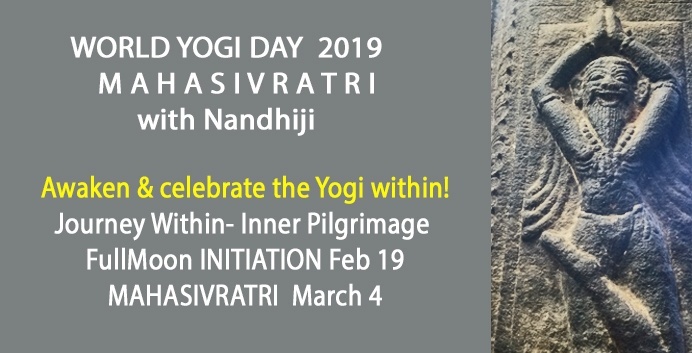 Mahasivratri holds the ultimate objective of yoga, the grace of awakening and expanding Consciousness, enlightenment is the gift of Mahasivratri. When Consciousness expands, we utilize our entire mind potential and tap into the states beyond mind- turiya states. 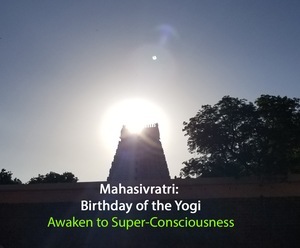 For a yoga practitioner, meditator and seeker Mahasivratri is like a birthday, the day of awakening to the vastness of ourselves as Spirit- the newer consciousness. This is the night when Sages who meditate in seclusion throughout the year in solitude come out to bless humanity. To escape wild animals he climbs above the vilva tree (vilva tree considered sacred Lord Siva) and stays up all night in repentance. Unknown to him was a Siva Lingam and his unconscious movement through the night caused the vilva leaves (a sacred offering for Lord Siva) kept falling on the Lingam. By virtue of staying up all night, a mind surrendered to the infinite in repentance, unconscious worship of Lord Siva through the Lingam- the thief got enlightened. This thief story is to illustrate the ease of awakening with little effort when tapping into the energies of Mahasivratri. Masters of ages from Einstein, Mahatma Gandhi, Rumi, Nelson Mandela had woken up to the next higher level of consciousness and it is from this mind realm that they were able to shine as Masters. Yogis call this supermind states of super-consciousness – turiya. My Guru, Siddha Ayya sat for eighteen years without moving in his cave on the peak of Arunachala drinking one cup of milk a day. He had gone beyond sleep. He was in states of turiya. Turiya is described as the ‘sleepless sleep’ state. In states of turiya, our mind potential is more than completely utilized. We awaken the various forms of siddhis (ESP) that is uniquely within each of us as the genius. Turiya states is depicted as Gods and Goddesses with multiple heads of ten and hundred to illustrate our innate ability to be the Many as One. To attain turiya states is the objective of yoga. This sublime state of higher consciousness is in simple words- the genius of the Spirit having the human experience of inspiration. Our each thought has become wisdom. Turiya states happens when the crown chakra, the Sahasrara, has blossomed with the thousands of petals of consciousness having unfolded. When the crown chakra has blossomed like a lotus, the journey of a Siddha, an enlightened Being, has begun. Turiya has been mentioned to have 18 higher states with the last states of turiya being more God like in attributes. Lord Siva (mentioned as Lord Shiva in North India) is that beyond void, the energy of infinity. When our limited soul stuck in ego of “I” wakes up to realize the vast Being of Spirit that is truly whom we are, our jivatman (individual soul) becomes Paramatman (Vast Infinite Self that is mentioned in the Christian tradition as the Holy Ghost), Lord Siva- the limitless Being. Lord Siva, the Yogi is called Satchidananda. Sat is Consciousness; Chit is experience; Ananda is Bliss. When turiya states is attained, we are the Master having attained turiya states – a mind of clarity, the wisdom of knowing, the grace of Cosmic unions- yoga and the form of bliss. Our journey through daily yoga gives us drops of nectars of Siva Consciousness, ie, bliss, wisdom, tranquility, joy and vitality. When we do an inner pilgrimage aligning ourselves to Mahasivratri, we attain being Consciousness itself with turiya states our natural mind realm. Our potent thoughts create magnificent realities. As Yogi, we uplift humanity in the vibrancy of our Being. Observing Mahasivratri to attain the awakening to be Lord Siva, the Yogi step out of the cage of time. The liberating experience of Mahasivratri is the once a year pilgrimage that needs be digested each week on a special day we set for ourselves. Choose one day a week to do yoga, meditate and connect with Source as to expand the Mahasivratri blessings of turiya states. Mahasivratri and Turiya: One of the key observances during the night of Mahasivratri is to stay awake all night. In reality, it is not about being a weekend warrior staying up all night singing, chanting and dancing, but about training ourselves to go beyond the mind and its sleep pattern through meditative practice. At the time vortex of Mahasivratri, we are able to experience the ‘sleepless sleep’ state with less effort. Our mind that has experienced the state of turiya is forever expanded in consciousness. Take the initiation to start the pilgrimage within. Set our calendar for the full moon day 2 weeks before Mahasivratri- Feb 19 2019. Let this moment be the Source initiation. Begin each day with light a lamp (to kindle our inner lamp) and end the day lighting the lamp- with mantras. Wake up with the mantra, be aware of each moment in the mantra fires, before sleep recite the mantras. Make the mantra fires a 24/7 inner heart song. Detox the mind & body. Through the 14 days let go of the thoughts, the mind, the ego and all the attachment. Forgive others. Forgive ourselves. Let go of past. Have just nuts, fruits, fruit/vegetable juices and herbs (consult an ayurvedic practitioner of the ideal herbs you could take). Taking ayurvedic herbs amplifies its healing abilities during this period. Be in a nurturing environment. Surround yourself with higher vibrational Beings or be in solitude. Observe silence. Silence the mind and thought process through the joy states of mantra recitation and a meditative mind. Most important- power of ‘pull’, the grace of yoga: Consummate the grace of Mahasivratri, the pull element by doing dharma/ charity/ heart’s service- random acts of consciousness. Drop all habits and addictions. It could be cigarettes, coffee, internet or even anger. Step out of the mind that functions in karmic imprints of the past. Each day, welcome the vast new crisp energies of clarity, revitalization, rejuvenation and states of bliss. Witness the experience of bliss & joy that eliminates hunger and thirst. Be aware of the ecstasy of experience that increases with each passing day as the mind withdraws. Feel the need for sleep subside. Let our meditative mind experience being a pillar of Light. On Mahasivratri night, enjoy the effortless ease of sleeplessness, bliss, perpetual energy, joy, clarity and states of Oneness- the states of turiya. Nandhiji offers his guidance to any seeker on the journey on this sacred Mahasivratri night. Please join his Facebook page under Nandhiji or his Mahasivratri group to receive inspirational videos and guidance throughout these sacred 14 days of inner pilgrimage.